This is an online review of the DVD Lord Of The Rings 2, The Two Towers. With movie synopsis, cast, pictures, wallpapers, quotes, where to buy it and more. This Special Extended Edition on Platinum Series of the epic worldwide phenomenon features 43 minutes of never-before-seen footage; providing fans with even more character depth and story detail. Picking up where the first film left off, Peter Jackson's THE TWO TOWERS throws the remaining members of the Fellowship into the scattered chaos of Middle-earth, now fully under siege by the forces of Sauron. While Frodo (Elijah Wood) and Sam (Sean Astin) journey to the dreaded Mordor, Merry (Dominic Monaghan) and Pippin (Billy Boyd) are held captive by orcs, and Aragorn (Viggo Mortensen), Legolas (Orlando Bloom), and Gimli (John Rhys-Davies) search for their abducted companions. Soon Frodo and Sam are joined by the sulking and duplicitous Gollum (portrayed by the voice and motion-captured acting of Andy Serkis), who becomes their guide through the barren lands leading to Mount Doom. Meanwhile Merry and Pippin encounter the looming Treebeard (voiced by Rhys-Davies) and Aragorn, Legolas, and Gimli find themselves in the land of Rohan, accompanied by an old friend. As the tale continues, each scenario becomes more perilous, and fierce battles erupt at both Isengard, home of the treacherous Saruman (Christopher Lee), and the massive Helm's Deep. After masterfully setting up the world created by J.R.R. Tolkien in THE FELLOWSHIP OF THE RING, Jackson continues the trilogy with the increasingly dark and battle-filled TWO TOWERS without skipping a beat. Although the director takes a few more liberties in adapting the second installment, he skillfully cuts from one scenario to the next, creating a tightly woven tapestry with the various storylines. Joining the impressive cast this time around are Miranda Otto as Éowyn; Bernard Hill as her father, King Théoden; Brad Dourif as the aptly named Grima Wormtongue; Karl Urban as Éomer; David Wenham as Faramir; and Serkis under the remarkable CGI facade of Gollum. 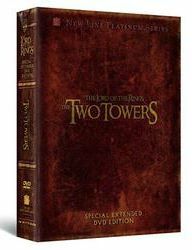 An intense epic that features one jaw-dropping sequence after another, THE TWO TOWERS more than carries its weight as the crucial centerpiece of THE LORD OF THE RINGS.